Take all of the below with the knowledge that i dont really understand what is really going on: I have a turnigy accucel 6,super easy to use and i am not the brightest tool in the shed when it comes to this sort of stuff,alongside my giant cricket bag its my fav bit of kit that i dont actually wear. https://www.manualslib.com/manual/896711/Turnigy-Accucell-6.html?page=12#manual ^this should take you to page 12 which gives an overview of using the storage mode. Iirc you cycle through the options to storage mode, put it to 7.4v mode then hold down start. It will check that the battery type is the same as what is plugged in and alert you if not, you hold down start again and it will commence. Not once have i changed the amp i just use whatever the factory setting is. I use giant power batteries with a 35c rating. More pics needed of that bad boy!! To be fair theres so many good ootb + affordable AKs + M4s its easy to see why they dominate... i mean we ALL have atleast one of those.. r-right? i agree on the ROF stuff - certainly not something that needs a blanket ban but organisers shouldn't be afraid to step in if someone is taking the p1$$ (this swearing filter is beyond puritan sorry) I only heard of 'speedsim' yesterday but it sounds bang on what i like (rushing whilst wearing cool gear) All things considered when it comes to airsoft we have it pretty good here in the UK i think. To be fair this and the aa12/ngrs is like for like - completely new system, in a small package too. Titliest - how the mighty fall. Nothing against him but very much... "heres my ptw... and my real ar for comparison 😏"
OG 2004 - facebook has killed forums. Every community has a finite lifespan unfortunately. 2006-2008 arnies was amazing, chinese AEGs had made the game much more accessible, lots of american users joined and 'geardo'-ism was at its peak. Good times! 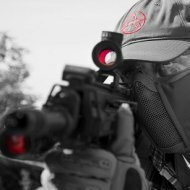 I have recently joined another UK airsoft forum but its got a bit of a sour vibe to be honest... i'm sticking around here. Edit - have to disagree with Rob on youtube reviews. Most of them are like 20 mins long - you could read a review in a fraction of the time and thats without the 'hhhheeeyyy there guuuys' youtube *suitcase* either haha. But also some of the review threads on here are priceless - hours and hours of shared experience of whatever platform going back years in quite a few cases. After 4 months and 15 days I have proper internet. I moved into a flat without a landline and it was a massive PITA and i will say no more!